Whenever I make crêpes – be it for a cake, a dessert or just with ice cream – there will tend to be a few crêpes leftover. 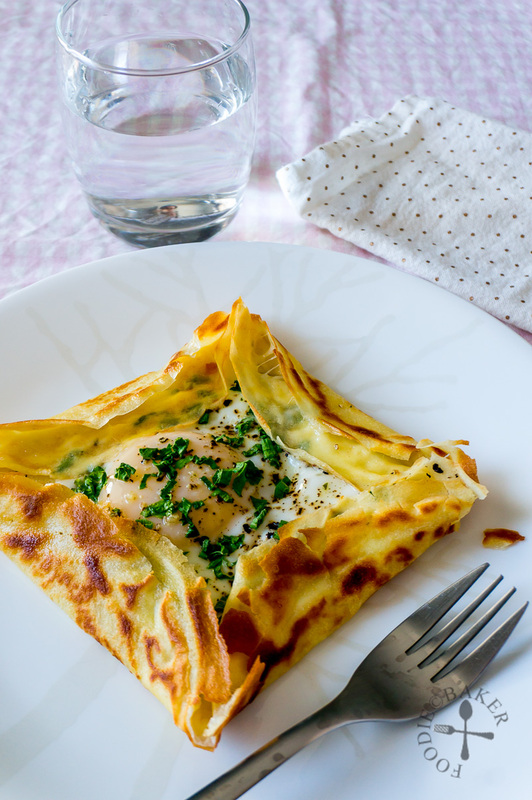 Not wanting to just eat them with more ice cream 😛 I decided to make a savoury Egg and Cheese Crêpe Square instead, which takes less than 10 minutes to make and it’s really tasty! 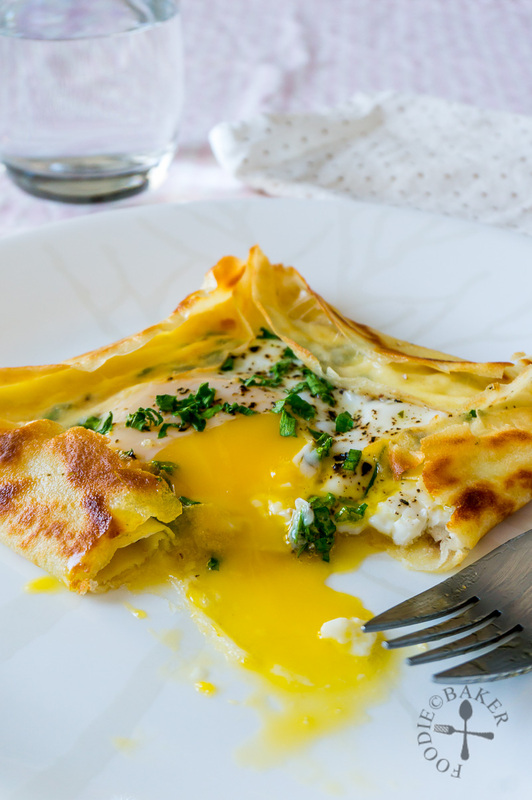 I used two crêpes instead of one to make this Egg and Cheese Crêpe Square, simply because I had 2 crêpes leftover – and it surprisingly turned out to be a good thing! The two crêpes are “glued” together with cheese (I used mozzarella this time round but you can use any cheese you like) – the bottom crêpe layer, which is in direct contact with the pan, becomes golden-brown and crispy, while the upper crêpe stays soft and chewy, yielding two different textures at the same time! Of course you can just use one crêpe if you have only one crêpe left 😉 I also sprinkled the cheese around the edges so that the melted cheese will “glue” the crêpe to form a square more easily. Just look at that oozy egg! To prevent the crêpe from burning but also to ensure that the egg is cooked (the egg whites should not be transparent but the yolk is still runny), I covered the frying pan with a lid – the heat trapped inside the frying pan will help cook the egg faster. With this method, there’s no need to cook the egg first or use the oven to cook the eggs! 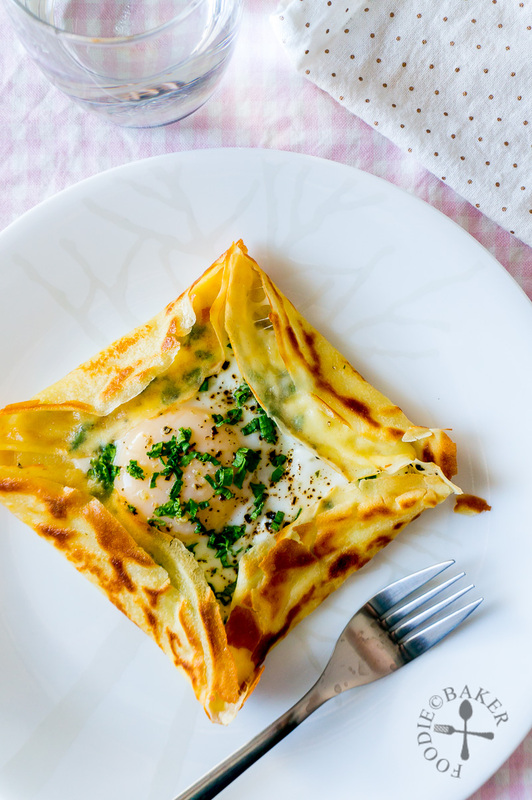 It’s easy to adapt this Egg and Cheese Crêpe Square into anything you like – you can add ham, smoked salmon, canned tuna, sautéed mushrooms, sautéed spinach etc onto the second crêpe before cracking the egg; or spread some aioli or mustard or whatever sauce you like. Just make sure don’t overfill the crêpe otherwise it won’t close properly to form a square! No step-by-step photos today but I’m quite sure you won’t need it! For the step-by-step photos and recipe of the crêpes (which is a fantastic Julia Child’s recipe), check them out here! Heat a non-stick frying pan (preferably the one used to make the crêpes) over medium-low heat. Place 1 crêpe on the pan and sprinkle with ½ of the cheese. Crack the egg in the middle and season with salt and black pepper (if your cheese is the salty kind, use less salt). Cover the pan with a lid or a larger plate and cook over medium-low heat for 2 to 3 minutes, until the egg whites are cooked but the yolk is still runny and the cheese has melted. Sprinkle the spring onion and chives on top, fold in four sides of the crêpes to form a square and slide it out onto a serving plate. Serve immediately. 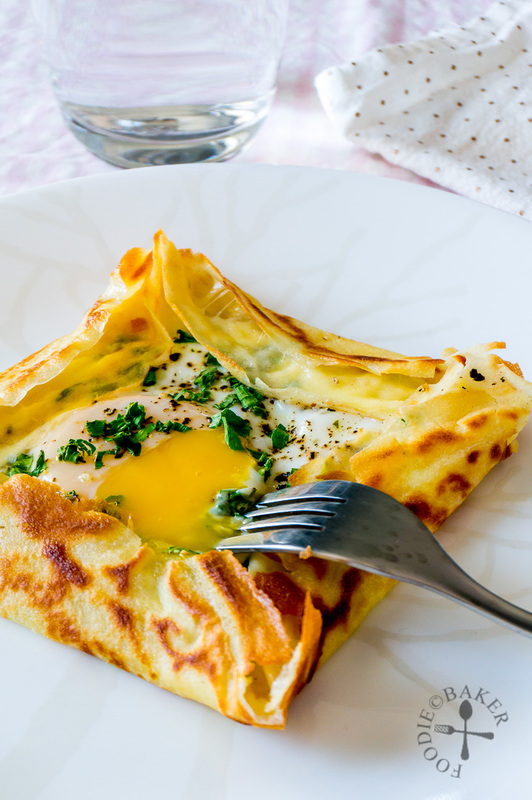 - You can use one crêpe instead of two to make this, just that you will lose the chewy crêpe texture as the bottom crêpe will become crispy. - You can add ham, smoked salmon, canned tuna, sautéed mushrooms, sautéed spinach etc on top of the 2nd crêpe before cracking the egg on top for a meat-version. Don't overfill the crêpe or you may have trouble forming a square. If you have seasoned the filling beforehand, cut down on the salt. This is the perfect light lunch recipe, I am definetly trying this one really soon. This is so neat and what a great idea to have the egg in the middle! Thank you for the compliments Caroline! Hi Jasline, your egg and crepe cheese look sooooo good, well done. Your pictures is outstanding. I think I can polish off 2 pieces at one go. :)) Thanks for sharing this wonderful recipe. Thank you so much for the compliments Amelia! I’m really surprised how well it went too, definitely no waste for any leftover crepes from now on!